These are really good and really easy sandwiches. Perfect for a weeknight meal. You can either use frozen breaded fish, make your own, or forgo the breading all together. I used frozen breaded fish…my kiddos love this! The spicy tartar sauce makes this dish. This recipe is adapted from Great Food Fast. Combine mayo through hot sauce in a bowl. 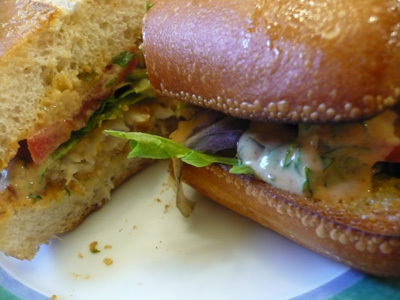 Place fish on baguette, add lettuce and tomatoes, and top with spicy tartar sauce.